Spring is a great time to be a cyclist in Calgary. The snow is gone – or what is left is inconsequential – and the temperatures are conducive to getting out on a bike. Calgary itself is lucky to have over 600 kilometres of bike trails. But there are also loads of great bike rides within 75 minutes to 90 minutes of the city. Here are my top 11 picks for Calgary and area bike rides. What’s your favourite bike ride in the Calgary area? Just 30 minutes west of Calgary you’ll find Highway 66, a road that’s closed to cars until May 14th – but only from the winter gate by the Elbow Falls parking lot. It’s snow free already! The road follows the Elbow River and affords fantastic mountain views and a great workout as you climb up to 500 metres – if you start in Bragg Creek. Park you car anywhere between Bragg Creek and the Elbow Falls parking lot. We started in Station Flats and rode a total of 32 kilometres. There’s a wide shoulder if you ride the highway before the winter gate. The only thing you have to avoid are the large piles of manure on the road from the free roaming horses. The return trip from Bragg Creek is 60 kilometres. Start in Turner Valley, a 45 minute drive south of Calgary. We parked at the Community Centre just off of Main Street. It’s a 38 kilometre one way cycle from Turner Valley to the dead end at Junction Creek. You could also shorten the ride by starting at the winter gate. Then it’s just 18 kilometres one way. Gain 645 metres of elevation from Turner Valley, 300 m from the winter gate. Ride past fields full of cows (look for cowboys) into the forested foothills. Along this section we saw a moose clear a fence in a few quick moves. At the winter gate the scenery gets better and better with mountain views appearing. Sheep River Falls is definitely a highlight and a great place for a picnic lunch. If possible do this ride before May 14th when the road is closed at the winter gate to all but hikers and cyclists. However, it’s a stunning ride in the fall – just go early to avoid much of the traffic. Built in 2010 to commemorate the 125th anniversary of Parks Canada, the Canmore Legacy Trail is 26 kilometers one way. Start at the outskirts of Canmore (there’s a great big parking lot) and peddle into Banff and then along Vermilion Lakes Road to get the classic Mount Rundle view. You can continue all the way to Highway 1A on a bike path. The elevation gain is only 185 metres; it’s easier biking to Canmore than it is riding to Banff. If you want an easy but scenic and family friendly bike ride then check out the 20 kilometers of well-marked trails in Canmore. They’ll take you along the Bow River (with lots of benches that will beckon you to stop) and through the woods. Sometimes you’ll feel like you’re miles from nowhere. Be prepared to cycle on a mix of pavement and gravel. Keep an eye out for wildlife. This is a wonderful 15.5 kilometre loop that climbs 142 metres in total. If you ride it before May, you’ll be able to enjoy a car free section on the western portion of the loop. There are grand views of Cascade Mountain, the Parks Canada iconic red chairs to hang out in along the shores of Two Jack Lake and a high probability of seeing Bighorn sheep. Those with energy to burn can add the Tunnel Mountain Loop accessed via Tunnel Mountain Road, about a kilometre past the Trans-Canada Highway overpass on the way towards the Banff townsite. If you think the landscape around Calgary is all pancake flat prairie you’d be wrong. Just south of Calgary you’ll find a landscape of rolling hills – including many that are very steep. This ride starts at the parking lot at the junction of Highway 773 and 22X. Climb roughly 600 metres over 55 scenic kilometres. It’s easy to add in a side-trip for a cafe stop in nearby Millarville. You could explore the 30 kilometres of paved bike trails in Waskasoo Park if you go to Red Deer. But if you’re a tad adventurous – and you have a detailed map then it’s worth checking out the backroads between Red Deer and Lacombe. Don’t miss a lunch stop at the Ellis Bird Farm but check to make sure it’s open. In total you can cycle a beautiful loop of almost 100 kilometres with most of it on quiet roads or trails. Start anywhere in Calgary and pick up the bike trail east of the Calgary Zoo that takes you over Deerfoot Trail towards the Max Bell Arena. Then look for signs saying Western Irrigation Ditch Canal and follow it for 29 sometimes bumpy kilometres to Chestermere. Some of the landscape isn’t pretty – but it’s interesting to see the industrial heartland of the city. And eventually you hit long stretches of scenic countryside. There’s lots of bird life and a perfectly positioned bench at the end of the trail when you reach Chestermere Lake. This is one of my favourite bike rides in the city. Easy to access via the Elbow River trails, it’s a great loop to cycle and one I love to do after work in the summer – providing I keep my mouth shut when the bugs are around. The Weaselhead section at the western end of the lake is the wildest part of the ride – and a place where you might get lucky and see some wildlife. Otherwise, enjoy the distant views of the Rockies and the sight of the sailboats or kayaks on the lake. It’s popular with walkers too so be prepared to deal with the occasional bottleneck. It’s easy to continue to Fish Creek Park and do a big loop back to the downtown if you’ve got a few hours. For a cafe stop, head to Good Earth at Glenmore Landing. For a great workout with non-stop mountain scenery – and a road without cars if you cycle before June 15th, then Highwood Pass is it. You can approach from two directions, the north gate near King Creek on Highway 40 or the south gate near Highwood Junction. The full there and back bike ride is 108 kilometres with 1267 metres of elevation gain, though many people just ride to the pass from either direction and then enjoy a great bike ride down. I carry bear spray on this route. Dress appropriately as it can be much colder in the mountains. Its 50 kilometres and and 160 metres of climbing to ride the full Dinosaur Trail. You can park near the giant dinosaur in Drumheller (you can’t miss it) and then head out and enjoy some of Alberta’s fabulous badlands scenery. Along the way you’ll pass the world-class Royal Tyrell Museum, Horse Thief Canyon, numerous oil wells and grain elevators. To return to Drumheller take the Bleriot Ferry – free of charge across the Red Deer River. You need about three hours with stops to do the full loop. Next PostDo You Have What it Takes to be a Coureur des Bois? @Linda Thanks. Hard to pick a favourite. I just biked Hwy 66 yesterday and it was great! Clear of snow, beautiful sceneries, thx a lot for the suggestions. I also try hwy 40 (today) from the north but unfortunately after 4.4km after the closed gate I had to turn around because of the snow. I can just imagine how stunning is this road, I’ll have to go back later in the season. :) thx again, Happy cyclist. @Linda Highway 40 should be clear earlier than normal this year so hope you find the time to do it again. I love Highway 66 and glad you enjoyed it. Fish creek has lots of fun off trail areas, also connects to the main Calgary pathway system and path to Chestermere. Would like to know more details on some of these routes, especially the Backroads from Red Deer to Lacombe. Can you please share some details on which HWY you took for this trip? (Would love to have something to eat at Ellis Cafe as well). @Ansel I am going to put you in touch with Red Deer Tourism in a couple of days when a colleague gets back who can probably give you the exact route. 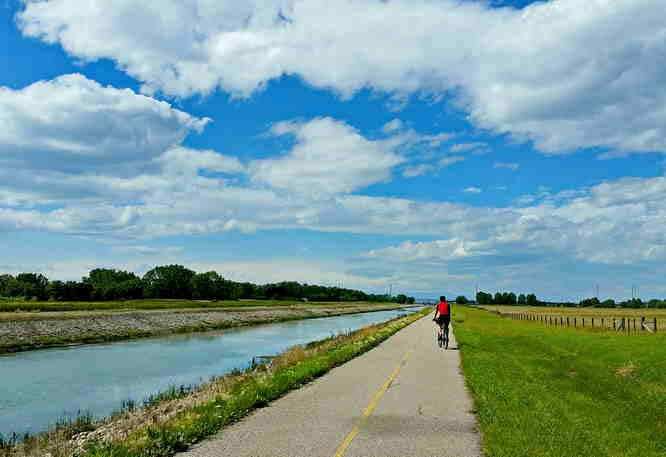 The Trans Canada Trail is an easy ride between Red Deer and Lacombe, starting by Bower Pond in Red Deer. Be sure to take the trail trough the recreation Center in Blackfalds. The only place in Canada where the trail goes indoors. Start at Nanton and go west to Hwy 22 then north to Longview/Black Diamond/Okotoks/Millarville depending how far one wants to go. Involves some logistics as far as getting to Nanton and back (if necessary) but challenging ride with terrific scenery. I rode this on a July Saturday morning in 2017 and found Hwy 22 north wasn’t nearly as busy traffic-wise as going southbound. @Mark Thank you for the great suggestion. There’s nothing wrong with driving to Nanton and doing it from there. I’ll move to Calgary soon and I’m bringing my road bike. Thank you for all these tips! @Rod Calgary is actually a really great city for road biking. You’ll have a lot of fun. Bill Milne trail in Kananaskis country is another good one I just did recently . Very good for all levels of cyclists. @Michael Great suggestion. I’ve skied it – just never biked it.